YouTube is undoubtedly the most preferred mode of video streaming on mobile when it comes to the US citizens. According to the latest data released by App Annie, Americans spent nearly a billion hours watching YouTube videos on Android this past July. 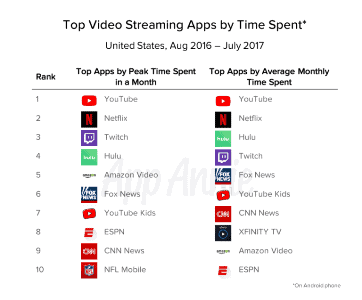 If we look at the all the 12 months ending July, this figure comes out to be 9.5 billion hours out of the 12 billion total hours consumers spent using the top 10 video streaming apps on Android. YouTube is far ahead of its next nearest competitors in the top five by peak time spent per month, including Netflix, Twitch, Hulu, and Amazon Video. Interestingly, YouTube also happens to be the top video streaming app by monthly active users, followed by Netflix. YouTube’s install base on Android is also twice the size of that of Netflix, likely due to the fact that the app comes pre-installed on most Android phones. Another interesting find was that more and more users are now using mobile app stores to pay for their mobile video subscriptions. During the 12 months ending in July, US iPhone and Android users spent a combined $570 million on video streaming apps, according to App Annie.